I can't let the day slip by without acknowledging Jared's and my anniversary today - it's been 11 years!! We've been busy all day preparing for Bird's birthday party tomorrow...cleaning, building, painting, planting, playing. I love parties, but all the more so for the motivation we get to pull things together around here. It's really a fun deadline. This morning (6:30am) Jared took Bird and Griffin and let me sleep a little longer. 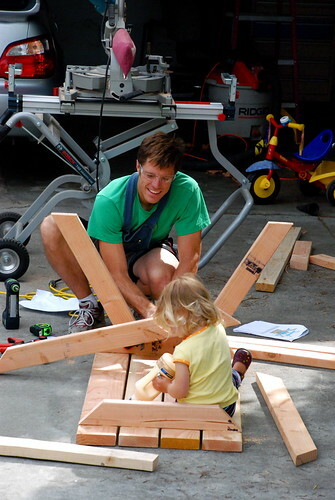 He then made cappuccinos, vacuumed (this helps Griffy fall asleep), got Bird breakfast and dressed for the day, then headed outside to start building the picnic table we wanted to have for kid's seating for the party. Is he not the most wonderful guy ever?? I feel so lucky to have found him (as seniors in high school no less), to have shared so many years and all the good & not so good times, and now to have our two beautiful kids together. Jared really is my rock - happy anniversary to you! And the table is built...I put on two coats of the same yellow on my studio door. It's super lovely and quite happily, we big people fit (just barely) into the picnic table seats too. Now for some sleep...happy weekend to you!